The retirement of Senate Minority Leader Harry Reid (D-NV) last week gives Republicans something they have been lacking in the early stages of this Senate cycle: a 50-50 shot at picking up a seat currently held by a Democrat. True, Reid's poor approval numbers meant he was going to be a target of Republicans anyway. But he's also a proven commodity 1 who would have had the power of incumbency. In our view, the open-seat race is now a Toss-up, as opposed to the prior rating of Leans Democratic. Democrats are only defending 10 of the 34 Senate seats that are up for election in 2016, which is a consequence of their poor performance on this map during the 2010 cycle, the last time this group of Senate seats (Class III) was contested. But of those 10 seats, three are open: In addition to Reid, Sens. Barbara Boxer (D-CA) and Barbara Mikulski (D-MD) also have already announced their retirements. Reid's retirement is almost certainly the most costly -- we still consider both the California and Maryland seats to be Safe Democratic, a rating that so far has been vindicated by the seeming lack of interest from big-name Republicans in running for either seat. California and Maryland probably will not become top-tier races in large part because both states should be comfortably won by the Democratic presidential nominee in 2016, even if that person loses nationally. The same cannot necessarily be said of Nevada. True, Nevada -- just like California and Maryland -- has been trending the Democrats' way, at least in presidential elections. For the first time since 1960, when John F. Kennedy narrowly carried Nevada and outperformed his national percentage of the vote, the Democratic presidential nominee (Barack Obama) did better in Nevada in 2008 than he did nationally, and he repeated the feat in 2012. Assuming a tight presidential election, one would expect the Democratic presidential nominee to be a tiny favorite to win the Silver State, and that would of course be helpful to the Democratic Senate nominee. But we don't know that the presidential race will be close, and we don't know how the White House nominees might affect the Senate race. Nevada did not have a Senate race in 2014, but it did in 2012, when appointed incumbent Sen. Dean Heller (R-NV) barely hung on against ex-Rep. Shelley Berkley (D-NV), despite Obama winning the state. However, Heller ran about the same as Mitt Romney in the state -- Heller won 45.9% of the vote, just 0.2 points more than Romney. Berkley ran nearly eight points behind Obama as the state's unique “none of these candidates” option proved a more attractive option for some voters (“none” got 4.5% in the Senate race, compared to just 0.6% in the presidential), while a right-leaning Independent American candidate got 4.9%. Berkley ran a poor race -- by her own admission 2 -- and she was dogged by criticism that some of her actions in office benefited her husband's business interests 3. Nevada's split decision in 2012 -- a Democrat winning the presidential vote while a Republican won the Senate race -- was somewhat unusual, and we shouldn't expect that to repeat in 2012, assuming both Senate candidates are evenly matched. That remains to be seen. As we noted even before Reid retired 4, if popular Gov. Brian Sandoval (R-NV) decided to run, he would start as a favorite. Sandoval is a widely respected politician who has governed as a moderate: In fact, he seems to be generating more criticism from the right than the left 5 with some of his recent budget proposals. He'd be well-suited as the Republican Senate candidate in a swingy state like Nevada. However, Sandoval would be running in a different environment than he faced in his comfortable 2010 election and towering 2014 reelection. The presidential-level turnout will be much higher, and Sandoval benefited from the lack of a top-tier opponent in 2014, which depressed turnout statewide and contributed to a GOP sweep up and down the ballot. To put it in perspective, while Sandoval got 71% in 2014, he actually only won about 4,000 total votes more than he got in 2010, even though he won 17 percentage points more of the vote. Sandoval is a very strong potential candidate, but the presidential-level electorate is just a lot different than what he faced in his two gubernatorial elections. Yet the Sandoval talk may be moot. The governor has shown no interest in running, as Nevada political expert Jon Ralston has repeatedly argued 6, and Reid's retirement might not change that. Ralston names state Senate Majority Leader Michael Roberson (R) as a possibility; others include former Lt. Gov. Brian Krolicki (R) and current Lt. Gov. Mark Hutchison (R). Reid effectively endorsed former state Attorney General Catherine Cortez Masto (D) as his successor, and Masto would be the favorite to win the party's nomination if she ran. Rep. Dina Titus (D, NV-1) is another possibility, though Masto is clearly closer to the departing Reid than Titus is (Reid backed another candidate against Titus in her 2012 primary, though that candidate later dropped out). 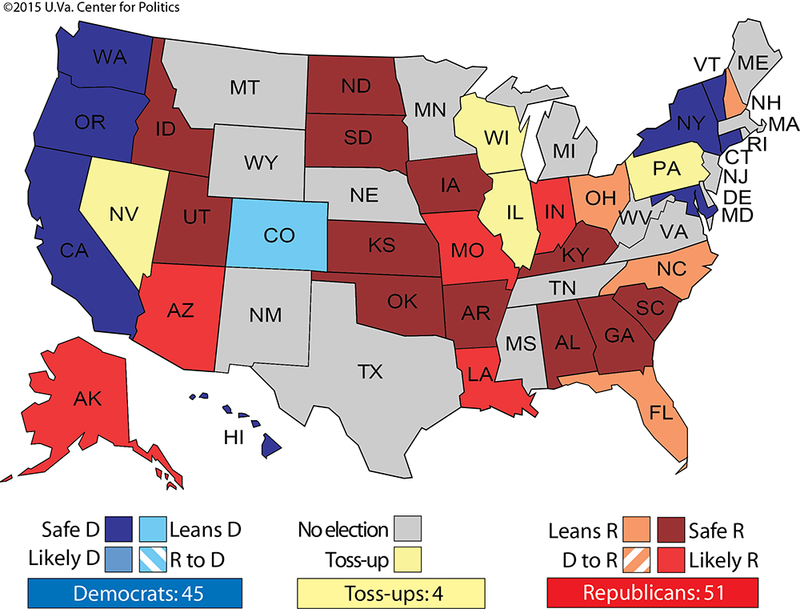 In sum, Nevada is probably going to be a hotly contested presidential battleground once again in 2016, and at this early stage, it's reasonable to expect the Senate race will be as well. Indiana: We do not want to overreact to what has been a difficult week for Gov. Mike Pence (R-IN), who has come under fire from state and national business interests, the NCAA, and many others for signing a bill that some argue 7 would allow local businesses to discriminate against gays and lesbians. Pence gave a disastrous interview to ABC's George Stephanopoulos last Sunday, during which he was asked six times to give a “yes-or-no” answer to a question about the effect of the law on gays, and his evasions were transparent. Remember, a governor only goes on a national Sunday show in these circumstances to clarify the facts (from his perspective) and to douse a raging fire. Pence succeeded only in turning a one-alarm fire into a four-alarm one. Since then, Pence has held a press conference insisting that criticism of the bill was inaccurate but that he wanted the legislature to clarify it anyway 8. The final outcome is indeterminate as we write this. This dustup prompted us to go back and look at Pence's upcoming gubernatorial reelection bid, assuming he doesn't run for president instead (a possibility that now seems a bit far-fetched). At least for reelection as governor, even after this embarrassment, Pence should be favored in 2016. Still, it is worth remembering that he only won in 2012 by about three points over former state House Speaker John Gregg (D), who might run again 9. Our Safe Republican rating was probably a bit too bullish for Pence, and we're moving the race from Safe Republican to Likely Republican, which still means that Pence is a clear favorite for reelection. He now has less room for error 10, however. Missouri: As the cycle began, we thought Republicans had a generic edge in the gubernatorial race in the Show Me State because we assume the Republican presidential nominee will win the state and, after eight years of Democratic Gov. Jay Nixon, Missouri might naturally be inclined to back a Republican gubernatorial nominee. But the race has already been thrown into a state of unpredictable chaos due to the tragic suicide 11 of state Auditor Tom Schweich (R), followed by the suicide 12 of one of his aides a few days ago. The Schweich suicide apparently had something to do with rumors that the state GOP chairman, John Hancock, had been spreading an allegation that Schweich was Jewish (he wasn't, though his grandfather was -- and in 2015, it is almost incredible that there are still people who would care). In the early going, former state House Speaker Catherine Hanaway (R) -- with whom Hancock is close -- was Schweich's primary rival, but now other Republicans are considering the race. These include former Navy SEAL Eric Greitens, state Sen. Mike Parson, and businessman John Brunner, who lost a 2012 primary for Senate. Democrats have united behind state Attorney General Chris Koster (D), a proven vote-getter who has been questioned recently over whether his office favored his political donors 13. The long-term effect of the Schweich tragedy is impossible to predict at this point, and while Missouri appears to be trending Republican in the Obama era, the gubernatorial race does not yet have a real favorite. 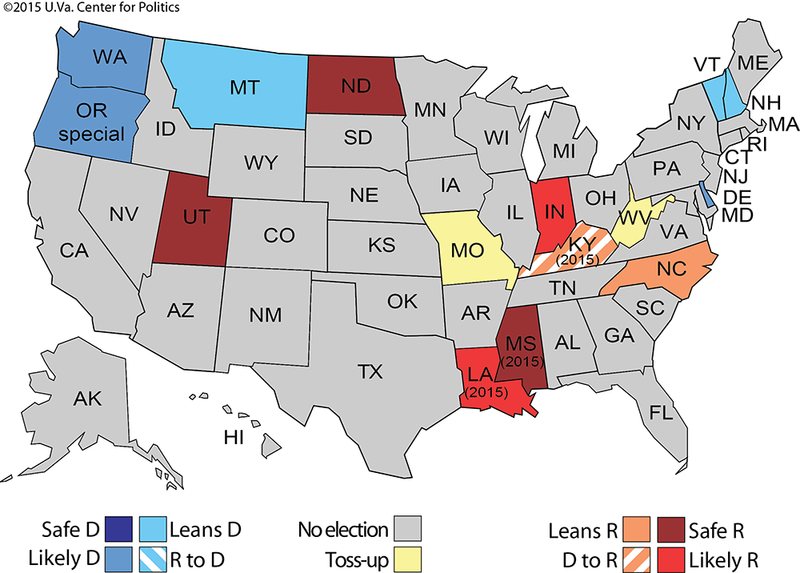 Therefore, we're moving the race from Leans Republican to Toss-up. IL-8: Rep. Tammy Duckworth (D, IL-8) announced earlier this week that she is challenging Sen. Mark Kirk (R-IL), which opens up her House seat. The district gave 58% to President Obama in 2012 and is effectively outside of the range of plausible Republican targets in a cycle with presidential turnout, so we're keeping it as Safe Democratic. Raja Krishnamoorthi (D), a former deputy state treasurer who lost to Duckworth in a 2012 primary, is already running, with State Sens. Tom Cullerton (D) and Mike Noland (D) as other possibilities. IL-18: Former Rep. Aaron Schock (R, IL-18) resigned after a story about his office decorating habits opened the floodgates to revelations about possibly serious ethical lapses. His downstate seat is heavily Republican -- Mitt Romney won 61% there in 2012. The rating here remains Safe Republican. State Sen. Darin LaHood (R), the son of former congressman and Obama administration Transportation Secretary Ray LaHood, is the favorite for the seat as other credible Republicans have taken a pass. Correctly, LaHood the Younger is taking care not to start measuring the drapes (or picking out paint colors 14) yet. A primary is likely to be held in late June or early July, with the general election to follow, likely in late August, according to Gov. Bruce Rauner's (R-IL) office.